Do you want to have a look at the Monet Garden while it is closed for the winter? Here is the Japanese bridge as it was this morning. 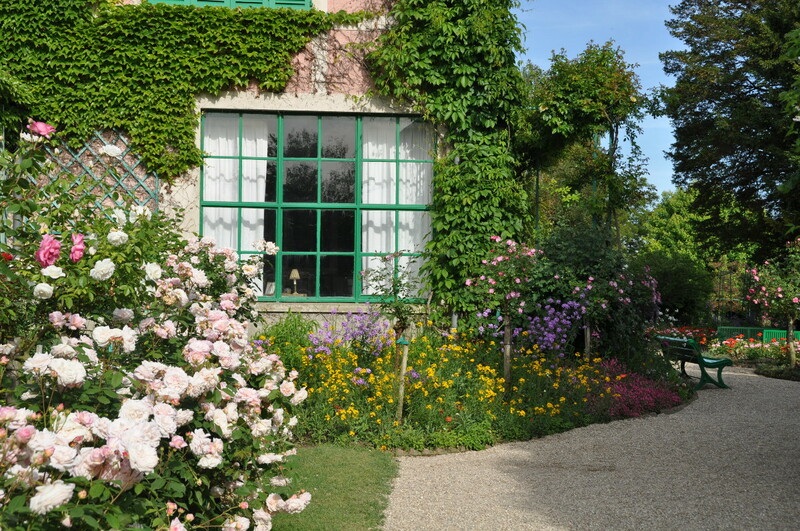 Giverny is now closed for five months. The village will awake again next spring. The first day for visiting the gardens will be Saturday 28 March, 2015. 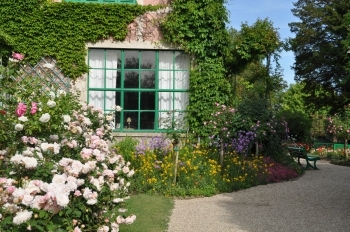 Yesterday I guided very charming hawaian guests at Giverny. It was nice to look at Monet’s gardens through their eye from Hawai. They reminded me that fall doesn’t exist on their island. It is summer all year round. Discovering the special spirit of this season sounded very exciting for them. Autumn has started to work its magic on the foliage. 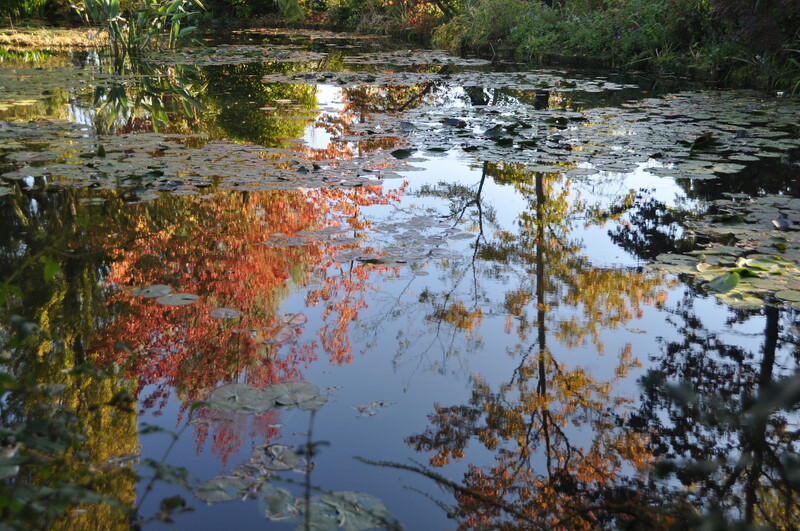 The three sweet gum trees reflect their reds and oranges into the water lily pond. For us, who know what will come next, this dramatic show of the saison, despite of its beauty, has a special flavour of nostalgia and melancholia intertwined. 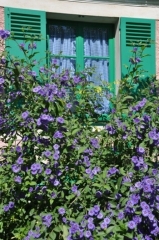 this is also Giverny, the village of the French impressionist painter Claude Monet. 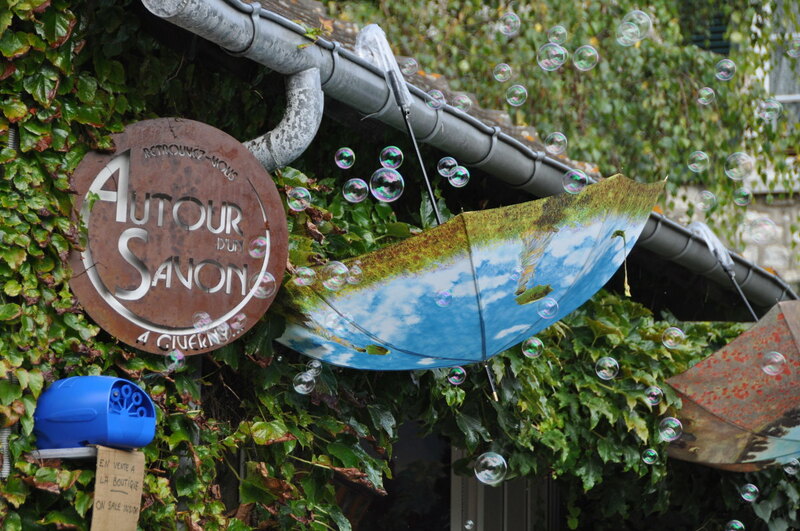 Every last Sunday of September, the main street of Giverny “Rue Claude Monet” turns into a sidewalk sale. Hundreds of booths display a large range of used things, from antiques to books and toys. 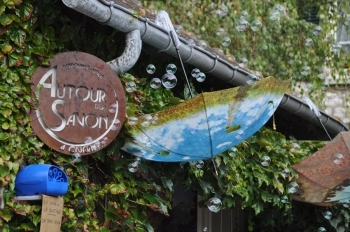 These so called Fairs to Everything (foires à tout) are extremely popular in the area of Giverny and attract thousands of visitors. 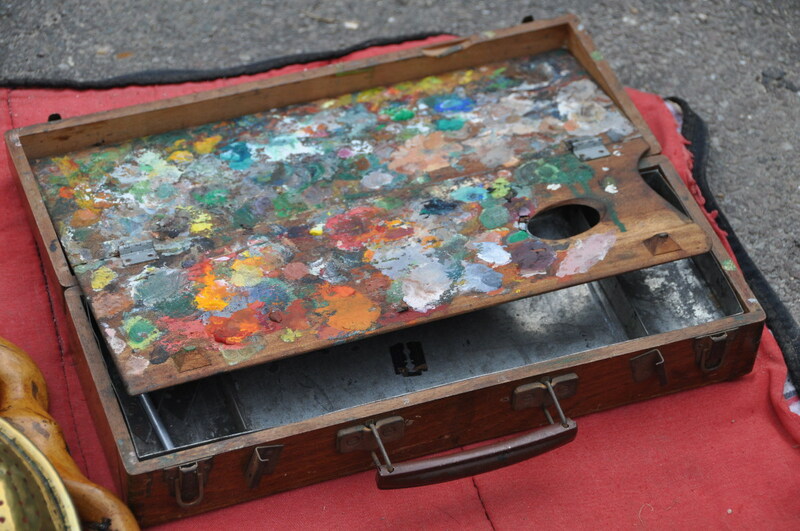 I photographed this paint box at the Giverny fair last week-end. It is a foldable one. I found it especially artful, if I dare say, because of the two little bumpers that prevent the two sides of the palet from sticking to one another when folded. Below, the zinc box is partitioned to contain tubes of color and brushes, and a bottle of solvent. Foldable means that the box was easy to carry outdoors for open air painting, the big revolution of the 19th Century. Thanks to the newly invented squeezable tubes of colors, artists were able to leave their studios and paint the landscapes they saw, generously lit by the sun. Happy new year, and best wishes for 2014! Here is the stunning ‘black’ garden of the Musee des Impressionnismes Giverny (Museum of Impressionisms). The garden was created twenty years ago, this is why it indulges in this modern fashion for so called black flowers. Aren’t they amazing with their dark foliage or petals? Of course black doesn’t exist for flowers, it’s always very dark red or purple, anyway unexpected hues for flowers. Planting them together like here, and not just as accents, produces a very special effect, surprising and maybe a little bit disturbing, doesn’t it? I like the black garden, but I love the white one next to it! The American impressionists will be back in 2014 in the gallery of the MDIG, that used to be the Museum of American Art Giverny, founded by Daniel Terra. The first exhibit will open on March 28, 2014 and is entitled “Impressionism and the Americans”. Featuring works by Cassatt, Whistler and Sargent, among many others, it will last until June 29, 2014. And for sure the impressionist painters used all the colors of the palette, not only black and white. This exhibition will be followed by a second one focusing on Belgian artists, “Brussels, an Impressionist Capital” from July 11, 2014 to November 2, 2014. With the start of the Summer, flowers become a bit mad at Giverny. 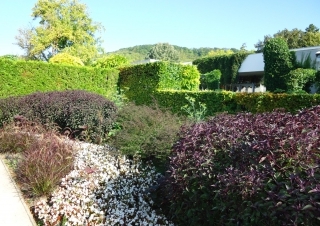 They grow crazily in the garden of Claude Monet, enjoying the combination of mild weather and moisture typical for the Seine valley in this time of year. Poppies, peonies, roses harmonize with eremurus, yellow sweet rocket or Canterbury bells in a charming way. Wherever you look, you see waves and waves of flowers. No line interrupts them. The secret of Claude Monet was to rise his flower beds slightly, in order to hide the path behind. 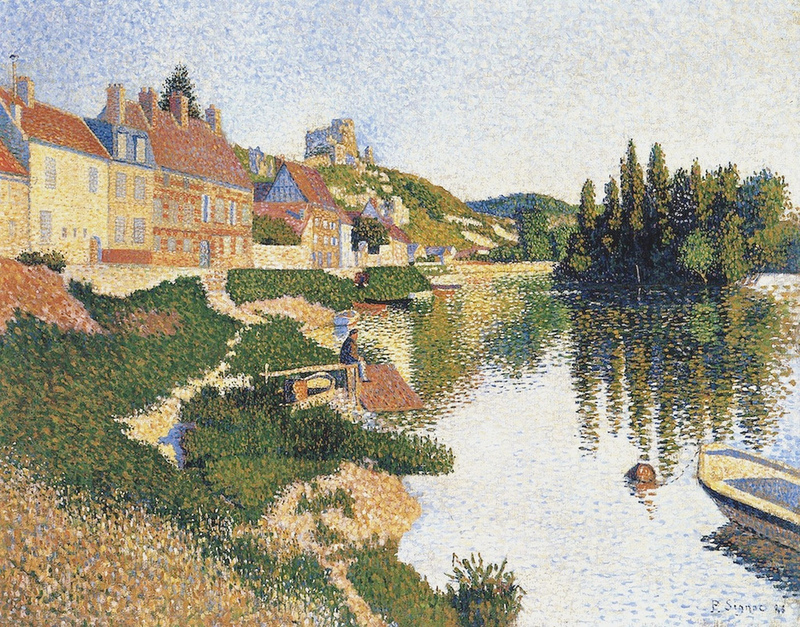 “Signac, the Colors of Water” is the title of the next exhibition at the Musee des Impressionnismes Giverny. 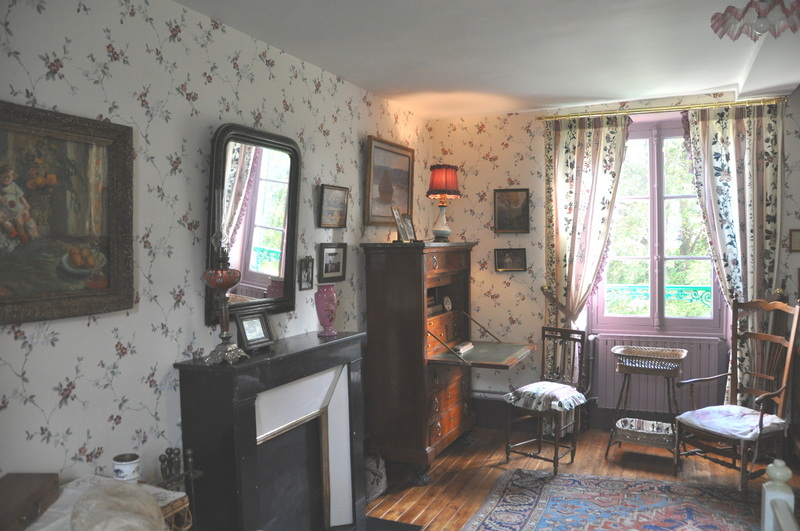 It will open on March 29, 2013 and display 120 works by the famous post-impressionist painter Paul Signac. Signac is well-known for his pointillist, sometimes almost mosaic like paintings. He also loved watercolors for a quick sketch of a place, especially harbors. Signac was a great admirer of Claude Monet. 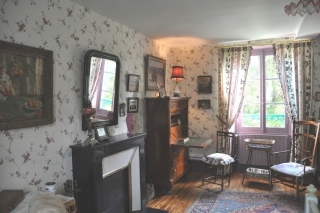 He stayed for the summer at Les Andelys, not far from Giverny, where Monet visited him and bought him a watercolor. 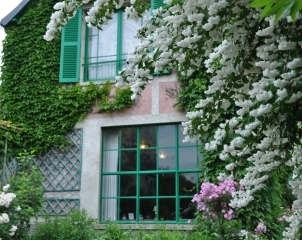 The Giverny exhibit includes a sumptuous view of the River Seine at Les Andelys belonging to Musée d’Orsay. 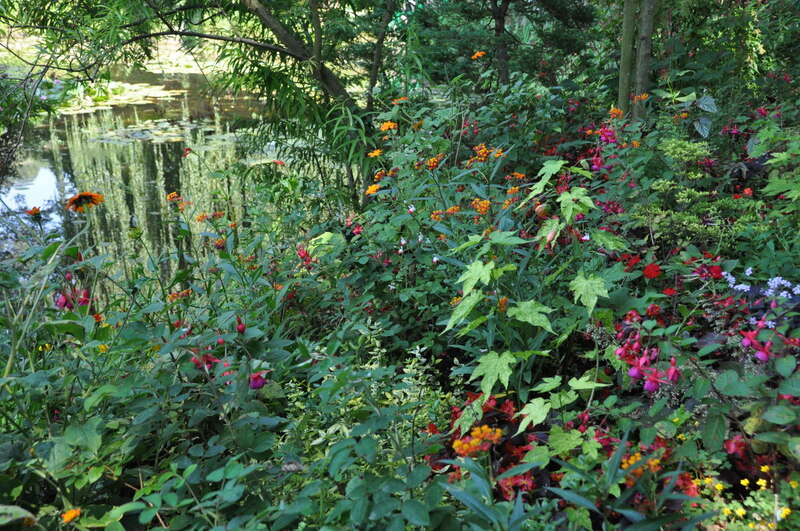 This flower bed graces the pond side in Monet’s water garden at Giverny. The main color is red, ranging from orange to purple. I’ve counted over 20 different kinds of flowers planted together, but there are probably more. Here are a few: New Guinea impatience, common begonia, angel wing begonia, common fuchsia, fuchsia microphylla, abutilon, asclepia, oxalys, sage, tithonia, heuchera, polygonum, sweet William, nicotinia… to quote only those that are flowering right now. 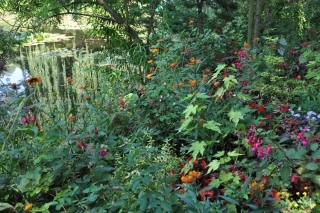 This border is a good example of the way Monet liked to combine flowers. 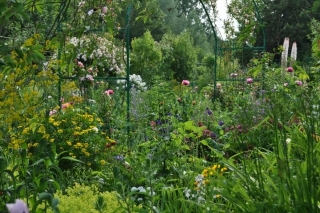 The appearant wildness of the garden is the result of a lot of work. Next to the first studio of Claude Monet at Giverny, the white waterfall of a beautiful philadelphus offers a dramatic show. It faces the little rose garden, just perfect by now. A bench nested at its feet is a nice place where to have a rest after meandering in the alleys. If the wind blows, it will let fall a shower of white petals on the visitors seated below. The question of the ‘best time’ to come to see Monet’s gardens at Giverny is hard to answer. Many times are so beautiful! The iris period is one of my favorite. The irises are just at their peak right now, displaying their charms in waves of white and purple petals in Monet’s flower garden. 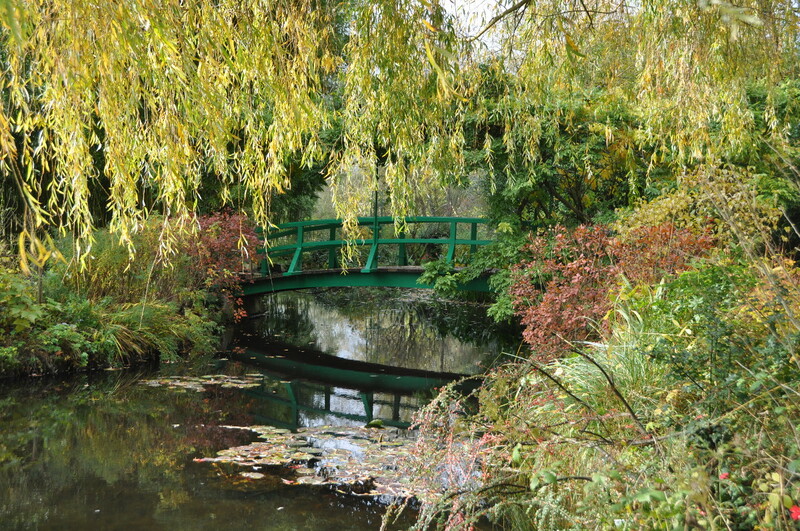 When is it the best time to see Monet’s gardens? There are so many, one visit is not enough, you must come back! 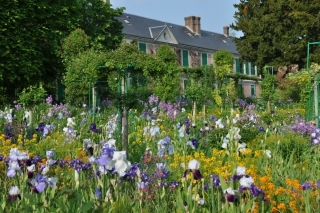 One of the charms of Monet’s flower garden is its countryside look. 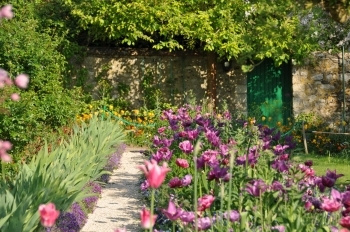 This secluded garden is surrounded by high stone walls typical for the backyards in the region of Giverny. While the houses open on to the streets, the walls are pierced by little wooden doors leading to narrow paths between the estates. 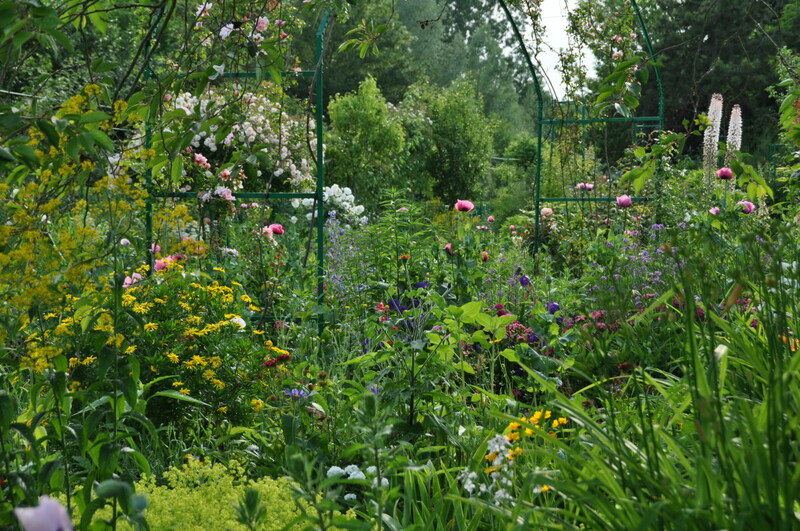 In Monet’s flower garden, this one was the way to the cottage of the head gardener in Monet’s times. Against the walls, espaliered pear and apple trees recall the former use of the garden as an orchard, before Monet turned it into a magnificent impressionist garden. The straight alleys look like those of the kitchen garden it used to be. 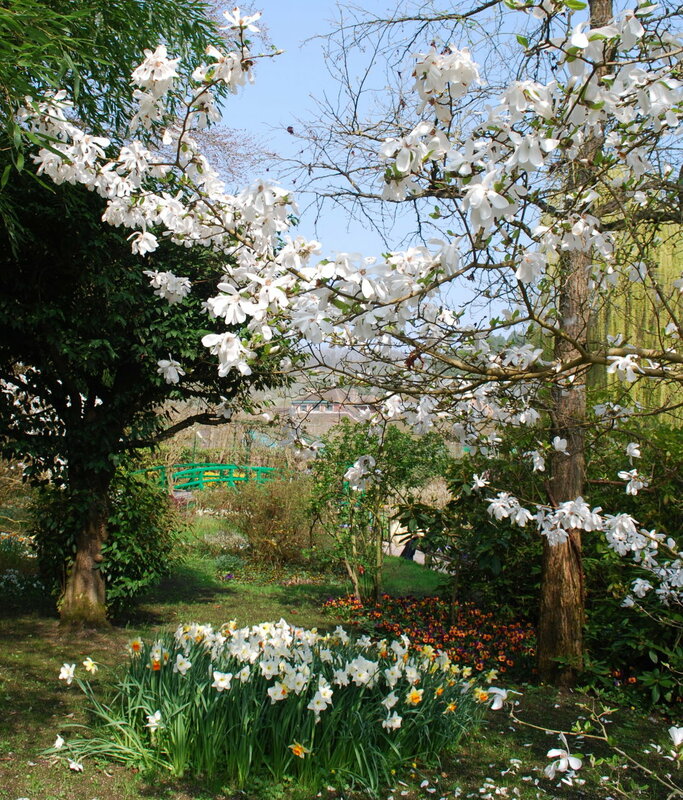 This is what you can expect if you are visiting Giverny in Early April. The white and pink magnolias are in blossom. Very soon, their flowers will fall on the lawns, creating a white circle at the foot of the trees. The pimples of weeping willows have burst, long branches of fresh green leaves hang over the pond, reflecting in endless verticals. Patches of yellow or white daffodils illuminate the spring grass and diffuse a fabulous scent. Monet’s pond, where only a few water lily pads announce the future splendour of Summer, is stiller than ever, and the atmosphere very peaceful. All the benches and bridges have been repainted a bright green. They look inviting. 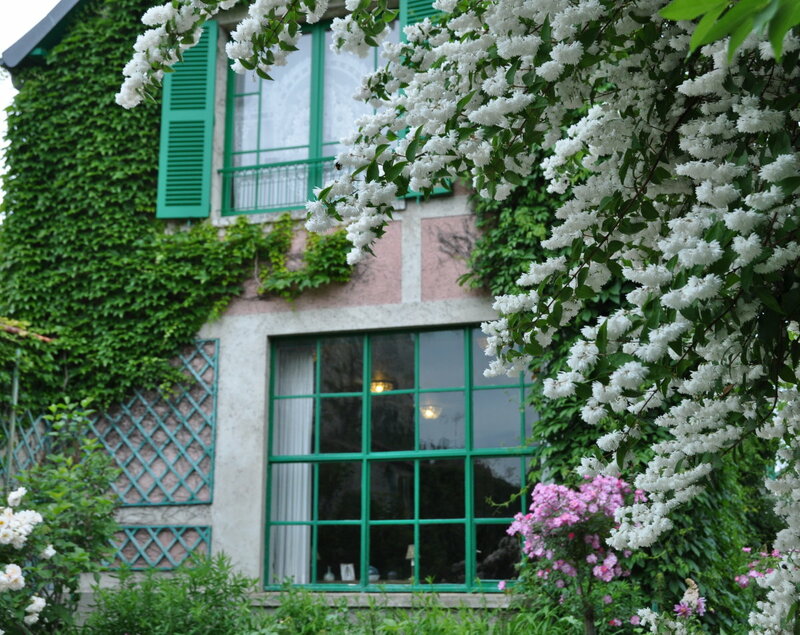 And birds sing like mads, offering the perfect voice track for a quiet and serene visit of Giverny.